Home / Fashion Journalism / In My Fashion / private collection / Suzy Menkes / The Suzy Menkes Collection / Suzy Menkes: Colour and pattern make every day joyous! Suzy Menkes: Colour and pattern make every day joyous! On Friday, the 12th of July 2013 Suzy Menkes personally unveils highlights from her private collection at Christie's. The Suzy Menkes Collection 'In my fashion' features more than 80 pieces from the private collection of pioneering fashion journalist Suzy Menkes. This online-only sale features an industry-insider’s careful curation of clothes, bags and accessories by fashion’s leading names, starting on the 11th of July at 7:00pm GMT. Awarded an O.B.E by Her Majesty the Queen (Order of the British Empire) for her services to journalism in 2005, and made a Chevalier de la Legion d'Honneur in France the same year, Suzy Menkes is an iconic fashion journalist who is held in the highest esteem by designers, models, fellow journalists and fashion followers around the globe. Comprising just over 80 lots, the collection features an inspiring array of dresses, coats, skirts, tops, jackets and accessories by a cross spectrum of the most revered names in fashion from Ossie Clark and Emilio Pucci, to Yves Saint Laurent and Christian Lacroix. All the pieces highlight Suzy's beliefs that colour and pattern make every day joyous and that clothes are like friends: they have to complement your personality, your hopes and desires. Estimates for individual lots start at £200, with the majority on offer for under £1,000. The star lot of the sale is an Yves Saint Laurent cocktail jacket from his 1980 collection 'le soleil' (estimate: £1,000-2,000). 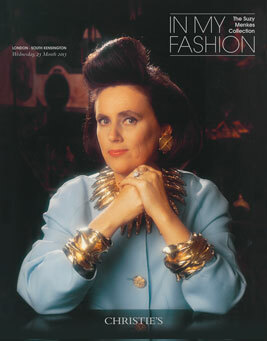 Born in Britain, Suzy Menkes has been the Fashion Editor for the International Herald Tribune since 1988. As a teenager in the 1960s, she went to study dressmaking in Paris, where she attended her first couture show at Nina Ricci - this sparked an insatiable interest in and passion for high fashion. Upon returning from Paris, Suzy read history and English literature at Cambridge University. Having graduated, she worked for The Times of London reporting on fashion (1966-69); was fashion editor for The Evening Standard (1969-77); women's editor for the Daily Express (1977-80); fashion editor for The Times (1980-87); and fashion editor for The Independent (1987-88); she is also a contributor to the New York Times 'T Magazine'. Suzy was awarded Freeman of Milan (1987); a chevalier of the Legion d'Honneur by President Jacques Chirac of France (2005); an O.B.E by Her Majesty the Queen of England in 2005 (Order of the British Empire) for her services to journalism; and, in January 2013, the Fiorino d'Oro Award by mayor Matteo Renzi at the Palazzo Vecchio; this is the highest Florentine honour, it was awarded in recognition of Suzy Menkes's outstanding contribution to culture and arts in the city.